Skillful handling of sophisticated legal matters gives businesses the best chance to thrive in today’s competitive market. 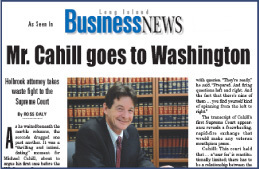 Backed by a talented staff, the Long Island attorneys of Germano & Cahill, P.C. have excelled in their respective practice areas over decades of legal service. Our lawyers confer an advantage on clients who seek counsel for environmental, land use and commercial real estate matters. We also have a unique blend of legal expertise and local knowledge that helps to secure successful results in municipal law matters and Industrial Development Agency transactions. As a comprehensive firm representing businesses throughout the New York metropolitan area, we deliver high-quality legal counsel that enables clients to meet challenges, achieve business objectives and navigate today’s complex regulatory environment. Strong community reputation — Our attorneys are all longtime residents of Long Island. Each principal has been practicing for at least 40 years and brings practical experience to his area of expertise. Individualized attention — Though we possess the same ability and professionalism as the largest firms, our small office enables us to deliver focused representation and unparalleled service. Advice suited to the needs of each client — We have the experience and flexibility to develop effective legal strategies that are tailored to your particular goals. Since 2003, we have given clients a decided advantage as they address key business concerns. In a free initial consultation we can apply our knowledge and experience to your legal challenge. Business law — Whether you’re looking to start a new venture or require assistance with issues such as contract disputes or employment matters, our business and corporate law attorneys will help your operation overcome legal challenges. Land use and zoning law — For all land use and zoning law concerns, we have a detailed understanding of the crucial laws and practical considerations necessary to obtain the decision that you seek. Municipal law — Our firm advocates for public agencies and private clients in a full range of municipal law matters relating to administrative and construction issues. Commercial real estate — We provide effective commercial real estate counsel for some of Long Island’s largest property owners and developers. Industrial Development Agency transactions — If you require assistance with an Industrial Development Agency transaction, our lawyers can assess your situation and guide you toward a beneficial agreement with the relevant government body. Environmental law — Our firm’s environmental law attorneys have a long track record of winning favorable outcomes in cases relating to solid-waste management, impact statements and other concerns. Whatever type of legal issue you bring to us, our familiarity with the local and regional landscape maximizes your likelihood of obtaining a successful result. Germano & Cahill, P.C. represents clients in Suffolk County and across the New York metropolitan area in commercial real estate, municipal law and other matters. Please call 631-588-8778 or contact us online to schedule a free initial consultation at our Holbrook office. Germano & Cahill, P.C. is located in Holbrook, NY and serves clients in and around Holbrook, Holtsville, Blue Point, Bohemia, Bayport, Sayville, Ronkonkoma, West Sayville, Oakdale, Lake Grove, Nesconset, Islip Terrace, Islandia, Central Islip, East Islip, Smithtown, Saint James, Stony Brook and Suffolk County.